Hand to Hold Foundation has launched an SHS course transition summit at the Lady Fatima Girls School in Madina. The summit, which was purposely engineered to educate, empower, motivate and redirect the energies of students into discovering their potentials as they pursue their formal education handled various topics such as academic discipline, choosing the right career and power plan for career success. In addressing the students at the event, Dr. Hajj Harun Speed Zagoon, who spoke on the topic “Academic discipline, the core value of excellence” opined that without education, the human world would be useless. He encouraged the students to seek beneficial knowledge in order to impact society wholeheartedly. Dr. Hajj further advised the students not to abuse any opportunity granted them in order to acquire the requisite knowledge. 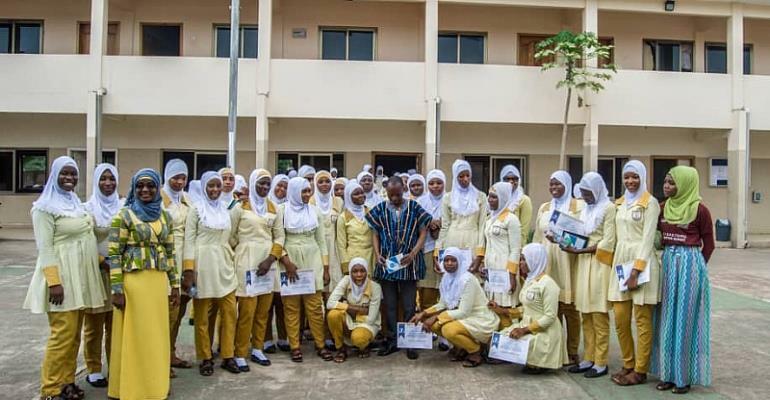 Dr. Gyan Kwabena urged the students on the need to have good models and mentors, eliminate procrastination and be creative thinkers as well as capitalizing on their strengths bt choosjng amongst the various courses to pursue to the tertiary level. Hajia Asmau Ayab, a facilitator at the event also advised students to avoid choosing career paths influenced by the decisions of their friends. She advised the students the need to have specific and concise goals in order to have a successful future. “You can force a horse to the river, but you cannot force it to drink the river water,” she intimated.